"I am very pleased to welcome you to Ensemble Studios' new community website. This website was built in direct response to your requests for more contact with us. One of the most exciting features is the addition of an Ensemble Studios monitored forum. Be sure to check out the rest of the site for features including player statistics (which is pretty much ES staff as of yet). HG's Dev Chat with Jerome Jones! All that and more. Check out the full transcript! Check out the full preview! Reminder: ES Dev Chat tonight! A reminder that the next ES Developer's Chat will be held tonight at 6:30pm EDT ("Forum Time"). Our guest tonight will be Jerome Jones, 2nd Lead Design on Age of Empires III. During the early development of the game, he spent a lot of time with the balance of civilizations and overall gameplay; but more importantly, he's in charge of the Single Player Campaign for Age III. The chat will start at 6:30pm EDT ("Forum Time") and end at 7:30pm EDT. Because of the shortened length of the chat, we'll be using a different format so we can get in as many questions as possible. We've enlisted the design community's help by asking them for questions they'd like to be asked during the chat. We're currently in the process of picking the best questions from the submissions to be asked during the chat. The chat will be held in the #heavengames chatroom on www.slashnet.org - you may use their webclient or your favorite IRC client to connect. The clan tags can be up to five characters and then you can have an additional clan name of up to 30 characters. The clan tag is independent of your login and will be prepended automatically but the clan name will only be visible in a user's profile. For example, in the chat rooms, you'll see members listed like:. The clan tag shows up in the UI as the same color as the rest of your name mainly for consistency. Clans can be created by any individual and once they're created you'll not be able to change the tag or name, but you can leave/destroy your clan and create a new one if you wish. Also, your login name can be up to 16 characters. Gamebiz.com has posted up a Bruce Shelly video interview (97.1 MB) from the Microsoft Developers Tour. There are also interviews from two upcoming Microsoft-produced games, the much anticipated Rise of Legends and Fable: The Lost Chapters. All three are definitely worth taking a look at. Last week we asked "What difficulty do you play the Demo AI on?" A majority of you said that you play on Moderate, with the next highest being people who play the AI at Hard. The lowest was Sandbox, which is expected. The transition from Sandbox to Easy is usually a quick one. This week we're asking you "Which gameplay feature has been the most fun for you?" Answer in our poll! Slothboy has created a custom lightset mod, where you can change between three different light configurations. Visit the thread for more details, including where to download them! As WON_SeR3NiTy reported on our forums, IGN has posted up a new showcase in the Russian civ. The showcase goes in details with Russian unique units, strategy tips, and the Russian Home City. Overall the article is a great read, especially since the Russians are probably the most unique civ in the game and the strategy involved playing them can be quite different. So don't waste your time, and read the showcase. Gone Gold: If you read this blog then I assume you are interested enough about Age 3 to have already heard the news that Age 3 has gone gold and is on target for release 10/18 as previously announced. The gold version was release candidate #5 (RC5) and build 3,236 in the history of the game’s development. It was officially submitted by ProducerDavid Rippy around 5 PM on Thursday, September 22 (one day ahead of schedule) after consultation with our Redmond Test Lead Fred Norton, and the Age 3 leads here in Dallas . You can check the blog out here. Ready your troops! Age of Empires III, the stunning real-time strategy (RTS) landmark from Microsoft and Ensemble Studios, is complete and poised to invade retail on October 18. Available in two versions - standard and Collector's Edition - Age of Empires III will fire up gamers with groundbreaking new features like the persistent Home City and jaw-dropping graphics never before seen in an RTS. Gamers can now experience the game first-hand with a recently released playable demo that offers hours of exciting combat challenges, as well as the ability to upgrade the player's Home City. 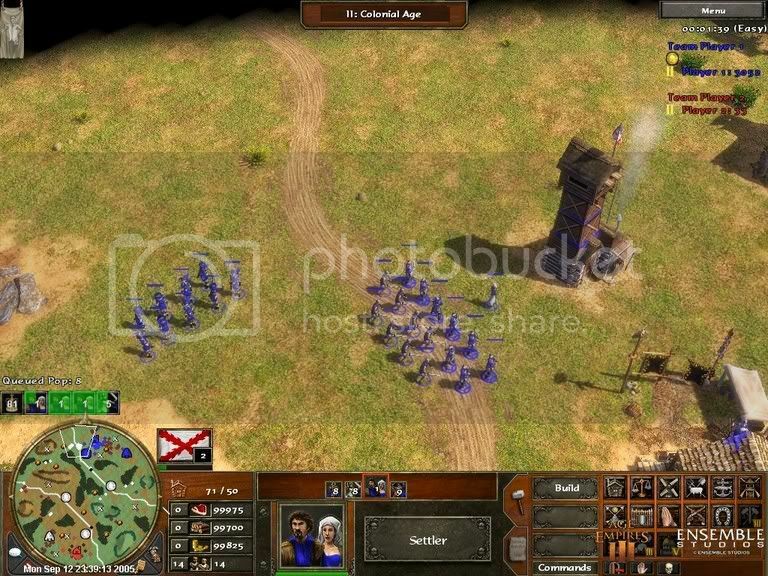 The third game in the illustrious Age of Empires series that has sold more than 16 million copies and defined the historical RTS, Age of Empires III is being hailed by critics as a new benchmark for real-time strategy games. The minimum system requirements for Age of Empires III are: 1.4GHz processor, 256 MB RAM, 64 MB video card that supports hardware transform and lighting, Windows XP, 56k modem for online play, and 2GB hard drive space. In Age of Empires III, players assume the role of a European power between 1500 and 1850 A.D. as they struggle to explore, colonize and conquer North and South America. Find out more about Age of Empires III by visiting http://www.ageofempires3.com . This is a new style map for the AOE3 demo, really designed for 2 players only, designed to be similar to a mediterranean style map from the earlier ES games. The map has a central lake or sea, with fish and whales ( I know - whales in a lake not real, but "gameplay>realism"), a water flag for delivery of units from the HC, 2 trade routes each with 2 trade post sockets, two mainland Native American villages and one Native American village on a central island. The two mainland villages are randomly (50/50 chance) either Cherokee or Iroquois, with the one on the island being the opposite tribe as the ones on the mainland. There are a few more sheep than on the New England map, and deer are plentiful. Each player is a little closer to one of the native villages than the other, each player starts out fairly close to one of the trading posts. The map size is somewhat larger than the usual New England but has a little less playable land due to the size of the lake. NOTE: this map may not play well for greater than 2 players due to its construction details - feel free to try, it might work 2v2, let me know if successful! If you like the description, then go right ahead and download it at our Downloads Section. DSO has reported in the forums that another new developer's blog has been posted on the AoE3 Website. The blog discusses the PR tour in Asia, Unit revisions and also talks about the new minimized UI. There is also a very interesting part about Gaming in Korea and MMOs. Clue to ES's next project? Check it Out. First, it is perhaps the leading edge of MMO gaming. Lineage and Lineage II are making millions of dollars monthly while a game called Cart Rider (I believe) has been making millions with micro-transactions. I read a report this morning that said online gaming in Asia was a $1.1B business and growing rapidly, with Korea being the largest segment. As usual, we will be holding a contest to pick who will ask questions for the chat - we will announce details for it in the upcoming days. This week we're asking at which difficulty do you play the A.I. (computer) on? I usually play on Hard when I want to win easily, but I often try some planned out strategies on expert and win. How about you? Go ahead and pick! Starting point : let your settlers get the stuff from the crates around your Town center and have your explorer starting to explore. (select him and right click on the map, or even the minimap to send him to various places). Once your settler are done, have 4 of them go on an animal to get food. The fifth one should go on wood and the 6th one should immediately build a house and then go on wood. Each house give you a free settler (british only), put it to work as soon as it is created. Make new settlers in your town center and have them busy on something. In the beginning you need food and wood, start to put settlers on mines later (end of age one or early age 2). Keep your Town center busy making settlers or changing age. As soon as you have enough ressources to change age, just do it (you'll know better later with experience, but it is OK to go this way to start). When you put your mouse on any given button (an upgrade, a unit, a building, the button to move through age...) it shows how much ressource you need to use it. To get to age 2, for instance, you need 800 food. You can view his guide at our forums. There is an expectation in any game set in this time period that the British have a lot of colonists. To achieve this feel in AOE3, the British civilization can train Settlers very quickly. Any time the British construct a Manor (the name for the British House), they produce a Settler in addition. Since training time is often the limiting factor for producing lots of Settlers, the ability for the British to simultaneously train so many Settlers gives them a very powerful economy. This economy is supported by a powerful military (including one of the best navies in the game). The British military strength is its versatility -- they have no real holes in their unit lines. Thanks to Eccentricity from The Colony for the heads up! There are currently two modes for the UI. You can only 'change' it by switching between two modes, Default and Minimized. Formations as they were, were a much more sophisticated attempt to add a lot of tactical (not micromangement focused) decisions to gameplay. And to better address the SMOC (Swirling Mass of Crap) that most RTSs suffer - certainly ours. They were beautiful, they were brilliant. But they, sadly, they had to be cut because we weren't going to have the time to get them in to shipping shape. There were a lot of bugs with the system complicated by and complicating the ongoing balance of the game. It is my fondest wish that we could patch formations in, or put them in the expansion, but I'm not holding out much hope. There are much, much more being discussed in that thread... so go check it out! Thanks to unjugon for pointing this out in our forums! 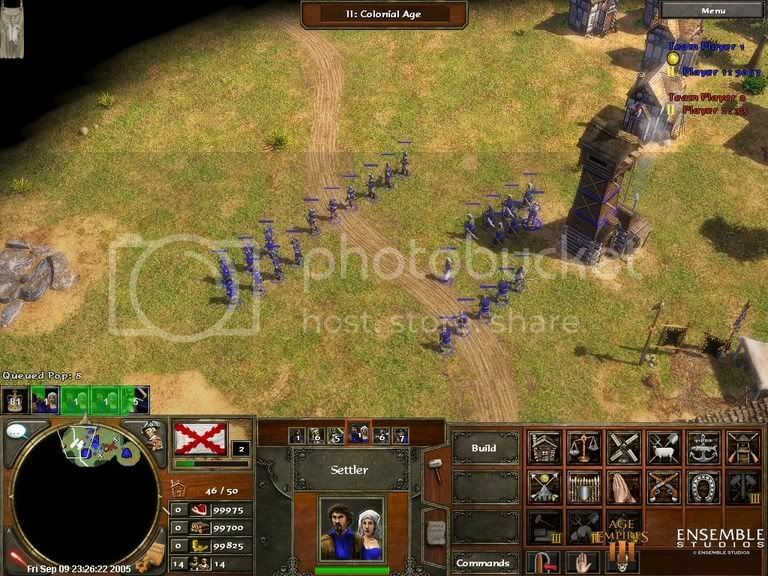 Download the Age of Empires III fan-site kit now! Special thanks to ascari for posting about it in our forums. Age of Empires III Heaven's staff is proud to announce the opening of our sleak Downloads Section. Our downloads section offers a great way to share and download the latest mods, random maps, and eventually multiplayer scenarios amongst other goodies. So go ahead and share your works :). Age of Empires III promises to be everything that its predecessors were, and much more. There are so many new additions and concepts to be found here that you'll initially be overwhelmed, but after only a few play sessions, you'll find yourself slipping back into the old familiar mindset, and quickly forget that it used to be any different. That's how effective the transition is - it just feels right, and is a natural extension of the familiar old gameplay. Add the prospect of some great multiplayer matches, and you'll be in heaven. Of course, the icing on the already delicious cake is the incredibly polished look and feel of the whole package. Doesn't have a whole lot of new info., but it does have a very large selection of screenshots to view. Check out the full feature here! Only one hour left to go! Tonight's Dev Chat will be with Dave Pottinger, aka ES_BigDog, Lead Programmer for Age of Empires III. The chat will start a 7:00pm EDT (Forum Time) - anyone can drop in and observe the chat as it is taking place - to do that, go to www.slashnet.org/java.php, and type /join #heavengames in the textbox at the bottom to join the chat. If you're IRC-Savvy and prefer to use your own client, the chat's happening on the irc.slashnet.org network in the #heavengames room. If you wish to give ideas or opinions on the new UI, drop by our forums and visit Bigdog's forum thread. We might do a new demo to catch all of the bajillion fixes we've done lately, but by then you'll likely have the actual game and you can go Frigate v. Frigate as much as you'd like. Although as DeathShrimp said, you'll probably already have the final build in your hands by the time the new demo is out, it's still good news that you can share a stable demo build with your friends to show them how kick-arse this game is! 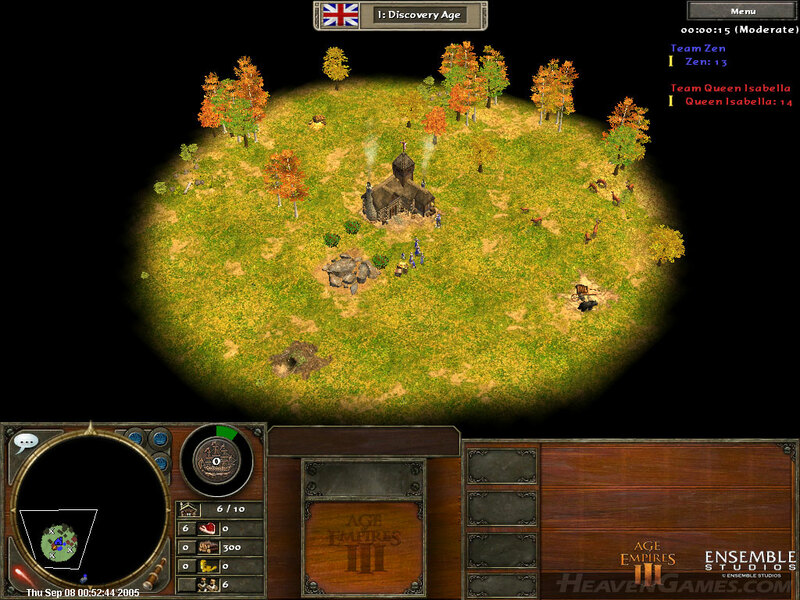 Don't forget - the Developer Chat with ES_BigDog - Dave Pottinger, Lead Programmer for Age of Empires III - takes place tonight at 7:00pm EDT ("Form Time") on the #heavengames channel on the Slashnet.org IRC Network. It's also my pleasure to announce the winners to the Dev Chat contest. Each winner should have received an email with instructions on how to enter the question queue for the contest by now. Congratulations! There were three winners listed that were winners at other sites - they each will still be allowed to ask 1 question each; thus opening 3 slots to runners-up. We're currently awaiting replies from participating sites we had contacted for the additional runners-up - when we get them we'll post them here. Also, my sincere thanks to all the webmasters that participated on such short notice! Papaya has posted up a list of scenario editor objects and triggers that he found while looking through the demo files. Right now it has a lot more triggers than the AoM editor had, meaning it will be even more powerful than before. The jury's still out on how much newb-friendlier it has gotten, if at all, but from the looks of the triggers, it will definitely produce some interesting effects in-game for designers. We've extended the submission deadline for our ES Dev Chat to Monday, September 12th, at 9pm EDT. Please send the answers to the following questions to me at zen@heavengames.com - winners will be contactged & announced Tuesday morning. Where were the tracks for Age of Empires III's soundtrack recorded? Which seven Dutch provinces signed the Union of Utrecht? Besides the Native Americans, what are the 8 civilizations that will be in Age of Empires III? How many bugs did ES fix as of today? Yeah, I completely forgot about this...I've been gone for a little while and will be gone for a while still because I am currently at college, which is pretty much eating up all my time. Once I've adjusted and my time is not being devoured quite as much, I will be back around and posting news, but for now my wicked cool staff will be taking care of you guys. If you give them any grief, Elpea has a baseball bat. When I get back, I'll do some kind of report on my travels here to Boston, which is a city in the New World featured in Age of Empires III! I'll try to get as many historical spots as possible (Salem for sure) before posting for your historical nerdy pleasure. Hey Agers! This is a reminder that we will be hosting the next ES Developer Chat on Wednesday, 9/14 at 7:00pm EDT ("Forum Time") on the #heavengames channel on the Slashnet.org IRC network. Our special guest for the chat will be Dave Pottinger - ES_BigDog, Lead Programmer of Age of Empires III. We are currently holding a contest to pick severl people who will have the chance to ask a question during the chat - scroll down to our news item from yesterday for more information on how to enter. Forummer Ceres629 made a nice little modification to the demo's RMS (Random Maps) files and came up with a way to make them larger. For those looking for bigger maps just download his small mod at the forums. Upstairs Juice Jimmy: One of the perks at ES since day one has been free sodas and snacks. We have large coolers on our two floors that are stocked daily with a variety of sodas, juices, teas, bottled water, Balls, etc. Everyone at ES takes a turn in rotation of being the soda stocker for a week. When someone misses their day, there is often a friendly/humorous reminder sent out by someone who can’t find a favorite drink cooling. Here’s a typical email exchange. Message: It’s me, I was sick yesterday and not in the office. Sorry master Cotnam, I will have your drinks chilling shortly. What are you waiting for? go check out the rest of the blog! We will be hosting the next ES Developer Chat on Wednesday, 9/14 at 7:00pm EDT ("Forum Time"). Our special guest for the night will be ES_BigDog - Dave Pottinger, Lead Programmer for Age of Empires III. The chat will be held via IRC on the #heavengames channel on the Slashnet.org network. Oh. One more thing. We've reserved slots for other fansites in the Age 3 community for the chat - participating sites will be holding their own contests to pick winners who will get a slot in the question queue. Keep an eye out for contest announcements popping up around the community! I've written a post on how to zoom out more in the demo - handy if you want to see more of the game, like so. Happy gaming! Okay guys, after reading the above post about the xml files, well i've figured it out. For everyone having this issue, you need to update your Microsoft XML parser. To update, download msxml.msi, install it, and the game should run. Important Note: Age of Empires III running on Windows 2000 systems is currently not supported by Microsoft, as Windows 2000's product life cycle for consumers ended this past June. Install at your own risk. If you have played the demo, make sure to fill Microsoft's Age of Empires III survey afterwards. It asks some questions relating to who you are as a gamer, and what you're interested in when it comes to gaming (including Age series-relate questions). It'd no doubt be invaluable to both Microsoft and Ensemble Studios to get your opinions, and would benefit Age of Empires III and future titles. Be sure to check it out! Ykkrosh, creator of the original AoMED, a tool to extract and convert Age of Mythology's files into editable content has done it again, this time for Age of Empires III. Ykkrosh has just released his new AoE3Ed, which allows anyone to extract Age of Empires III files and mod them as you see fit! This is the initial preview release of AoE3Ed, the successor to AOMEd. It should be enough to let curious people poke the demo's data files, though it doesn't do a lot else. Some previous modding experience is recommended. No artificial colourings. 97.4% less Perl. * Archive Viewer - open BAR files; view previews of many of the data files (text, XML, XMB, DDT, WAV) contained within; and extract them for editing. * File Converter - XMB<->XML, DDT<->TGA. Their usage should be fairly intuitive; if not, you may wish to suggest improvements or just wait for a non-preview release. There are various things that should be done and could be done, detailed below in a rough order of priority. If anyone considers a feature to be important, let me know and I'll possibly think of it as a higher priority. If you consider a feature to be really hugely important, bribes (perhaps of interesting topological surfaces or graphics cards) may help. Suggestions of higher-level modding tools (like, for example, an HC-customisation-mod editor and installer) would also be of interest, for some indeterminate time in the future. Additionally, reports of whether the final AoE3 release will include anything to help modders would be useful, to avoid duplicating work. The tool is still of course being worked on, so after trying it out please leave a comment and help it out! This error which some people have reported seems to happen mostly if you run a widescreen monitor. I believe the problem has been fixed since the demo was put together so it will work in the full version of the game. I actually got the error on my own machine when I installed the demo and I've found I think two work arounds on my own machine to fix it. Delete the file NewProfile.xml in your /Age of Empires 3 Trial/Users/NewProfile.xml directory. Open NewProfile.xml and fine the line that specifies the optiongrfxres and change the res to say 1024x768. In my particular case it was initializing to 1280x768, which my machine did not like much. It seems to only happen the first time you run the game, I believe once you get it up and running once, it doesn't happen again. Hope this helps, it worked for me. Be sure to let him know if it worked for you ... or not! - Approximately 370MB of Hard Drive space (not including installer). So there you have it, make sure your computer has those requirements and have fun! Age of Empires III Demo Out - The Wait is Over! I won't say much, I bet you won't read whatever and go straight to downloading anyway! Many thanks to forummer upke for finding it and posting it on his forum thread. If after trying all of the above you still have trouble running the demo, please visit this thread to see if other forumers may be of assistance. Since you are tasking most villagers to wood you have ample wood to produce longbows (they only cost wood and food) and plenty of pop room to hold them. Longbows are a very potent units and something that I will be looking forward to seeing is a nice longbow raid force though they are only available for 2 ages they will be a force to reckon with. Read the entire preview in our forums! Kor, residential Cherub history expert, has posted a lengthy article about the Dutch in our History forum. It covers 1579 through 1850, aligning with AoE3's time frame. Read the entire article in our History forum! Will you buy the Collectors Edition of Age of Empires III? Answer in our poll! For me, it will be the British. The first reason is that I am English myself, I think I am quite patriotic. In Age of Empires 2 I played as the English as well. The second reason is that I love the country's history. I cannot remember dates to save my life but I have some knowledge of what happened. I just would love to control of those red coats because I once read a book recently on the English Civil War and it told of the New Modal Army. It comprised professional soldiers led by trained generals, unlike other military forces of the era, which tended to have aristocratic leaders with no guarantee of military training. So far it looks like the majority of the posters want to try out the British too (second place being shared by the Spanish and French). What civilization will you check out first? Let us know in our forums! Gamer Revolution has posted up an Age of Empires III hands-on preview. What's new in this one, aside from another gamer's opinions on the upcoming AoE title? Very cool screenshots, something nobody gets tired of. Be sure to check out the full preview. Special thanks to The_Vger for posting about it in our forums! I spent some time recently at Eagle Games, the group that created and published the Age of Mythology board game. They are planning to do a board game about Age 3 to appear sometime after we finish the Windows PC game. The president of Eagle Games is Glenn Drover, an old friend from our days together at Microprose. He was in sales at that time but is realizing now his dream of creating games. Check the rest of the blog here. Hopefully it will be a short wait, but when it's released to the public, we'll make sure to let everybody know. In the meantime, feel free to read Dave's other demo comments in our forums! Well, the most interesting sounds in "Age III" were recorded on the field during a reenactment of the Battle of Gettysburg. I'd take my mic and DAT recorder as close as I could to whatever musket, cannon, or mortar was being fired at the time. I wound up with a lot of good stuff, much of which provided the basis of the gunpowder sounds in the game. Check the interview out here.